The question “What are you afraid of?” can be translated “What is it that immobilizes you? What is robbing you of sleep night after night? In this study, we will join Dr. David Jeremiah in examining these fears: defeat, depression, disconnection, disease, and death. 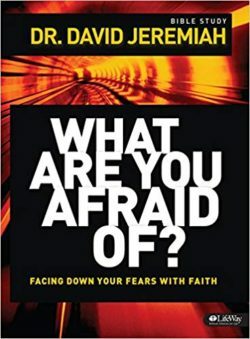 This study seeks to guide us to realize that God is the answer to all our fears and to replace our unhealthy fears with a proper fear of God. You can look to the future and see nothing except His power and love guarding your every step. You can find the truth that sets you free to live the fearless life God created you to enjoy. Join us these three days for this exciting and important study!